Wanting to practice the outdoor skills they'd learned and share their enthusiasm for the outdoors, several BOW alumni formed T.O.W.N. groups in their cities for women to meet who share their interests in outdoor recreation. Get together with other Outdoors Women, stay active and continue to learn. These groups have a diverse membership of skills and experience. Local T.O.W.N. 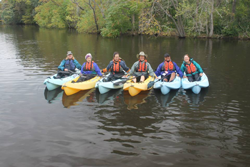 groups hold monthly meetings and coordinate field trips in a variety of outdoor activities for its members. You need not have attended at BOW workshop or necessarily have any outdoor experience to join the fun. To provide all women the opportunity to experience outdoor activities in a safe, non-threatening, and supportive environment.